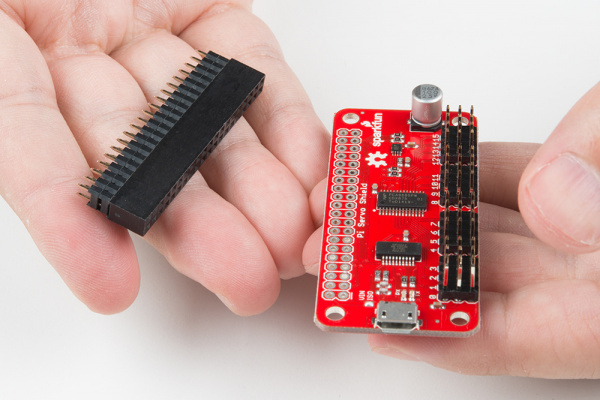 The SparkFun Pi Servo Hat allows your Raspberry Pi to control up to 16 servo motors via I2C connection. This saves GPIO and lets you use the onboard GPIO for other purposes. Furthermore, the Pi Servo Shield adds a serial terminal connection which will allow you to bring up a Raspberry Pi without having to hook it up to a monitor and keyboard. Here's what you need to follow along with this tutorial. We suggest purchasing a blank microSD card rather than a NOOBS ready card, since the NOOBS ready cards may not have a new enough OS to support the Pi Zero W.
A row of headers - break to fit. 40 pins that can be cut to any size. Used with custom PCBs or general custom headers. In addition, you'll want some kind of servo motor to test the setup. Try testing the examples provided later in the tutorial with the generic sub-micro servo first. No special tools are required to follow this product assembly. You will need a soldering iron, solder, and general soldering accessories. You may want to review these tutorials before undertaking this one. This tutorial covers everything you need to know about through-hole soldering. Learn how to use serial I2C and SPI buses on your Raspberry Pi using the wiringPi I/O library for C/C++ and spidev/smbus for Python. Servos are motors that allow you to accurately control the rotation of the output shaft, opening up all kinds of possibilities for robotics and other projects. 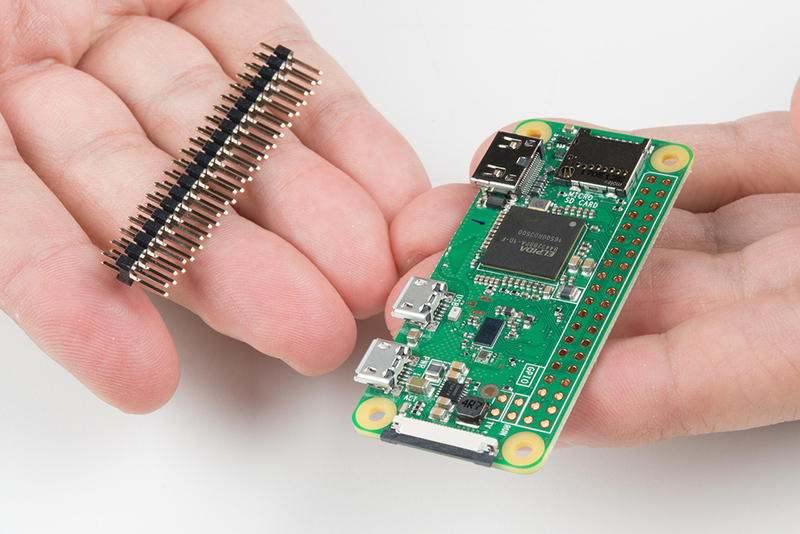 Learn how to setup, configure and use the smallest Raspberry Pi yet, the Raspberry Pi Zero - Wireless. There are only a few items of interest on the board, as it is a hat designed to be minimally difficult to use. USB Micro B Connector - This connector can be used to power the servo motors only, or to power the servo motors as well as the Pi that is connected to the hat. It can also be used to connect to the Pi via serial port connection to avoid having to use a monitor and keyboard for setting up the Pi. Power supply isolation jumper - This jumper can be cleared (it is closed by default) to isolate the servo power rail from the Pi 5V power rail. Why would you want to do that? If there are several servos, or large servos with a heavy load on them, the noise created on the power supply rail by the servo motors can cause undesired operation in the Pi, up to a complete reset or shutdown. Note that, so long as the Pi is powered, the serial interface will still work regardless of the state of this jumper. Servo motor pin headers - These headers are spaced out to make it easier to attach servo motors to them. They are pinned out in the proper order for most hobby-type servo motor connectors. 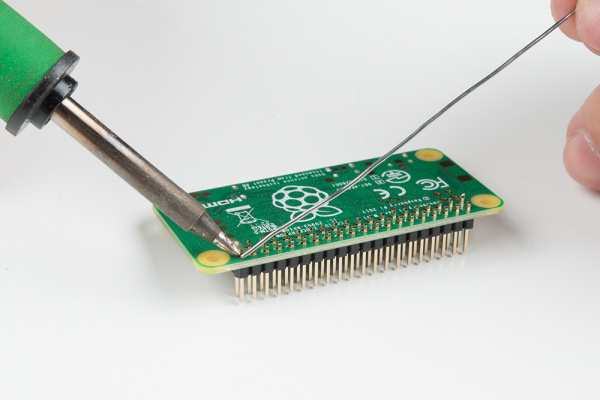 We suggest soldering the male headers onto the Pi Zero W.
My favorite trick for this type of situtaion is to solder down one pin, then melt the solder on that pin with the iron held in my right hand and use my left hand to adjust the header until it sits flat as shown below. 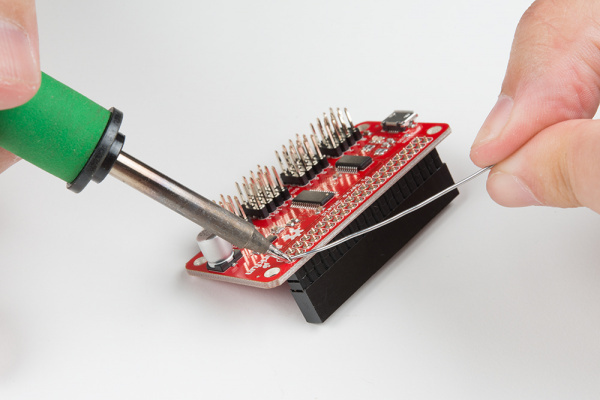 Make sure that you are soldering with the header's shorter side and the longer pins are on the component side. After tacking down one pin, finish soldering all the pins down to the Pi Zero W.
Repeat the steps with the female header and the Pi Servo Hat. Make sure to insert the short pins from the bottom of the board and add solder to the component side so that the Pi Servo Hat stacks on top of the Pi Zero W's male header pins. You will also need to make sure that the header is sitting level before soldering down all the pins. 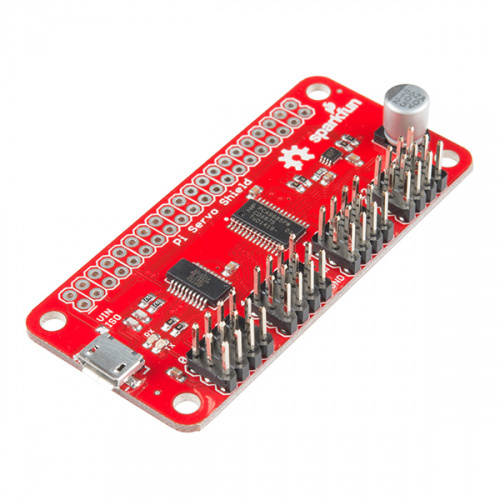 Once the headers have been soldered, stack the Pi Servo Hat on the Pi Zero W. Then connect a hobby servo to a channel "0" based on the servo that you are using. Try looking at the hobby servo's datasheet or referring to some of the standard servo connector pinouts listed in this tutorial. Using a sufficient 5V wall adapter, we can power the Pi Zero W. Plug the wall adapter into a wall outlet for power and connect the micro-B connector labeled as the "PWR IN" port on the Pi Zero W.
We'll go over in some detail here how to access and use the pi servo hat in Python. Full example code is available in the product GitHub repository. First point: in most OS level interactions, the I2C bus is referred to as SMBus. Thus we get our first lines of code. This imports the smbus module, creates an object of type SMBus, and attaches it to bus "1" of the Pi's various SMBuses. We have to tell the program the part's address. By default, it is 0x40, so set a variable to that for later use. Next, we want to enable the PWM chip and tell it to automatically increment addresses after a write (that lets us do single-operation multi-byte writes). That's all the setup that needs to be done. From here on out, we can write data to the PWM chip and expect to have it respond. Here's an example. The first write is to the "start time" register for channel 0. By default, the PWM frequency of the chip is 200Hz, or one pulse every 5ms. The start time register determines when the pulse goes high in the 5ms cycle. All channels are synchronized to that cycle. Generally, this should be written to 0. The second write is to the "stop time" register, and it controls when the pulse should go low. The range for this value is from 0 to 4095, and each count represents one slice of that 5ms period (5ms/4095), or about 1.2us. Thus, the value of 1250 written above represents about 1.5ms of high time per 5ms period. Servo motors get their control signal from that pulse width. Generally speaking, a pulse width of 1.5ms yields a "neutral" position, halfway between the extremes of the motor's range. 1.0ms yields approximately 90 degrees off center, and 2.0ms yields -90 degrees off center. In practice, those values may be slightly more or less than 90 degrees, and the motor may be capable of slightly more or less than 90 degrees of motion in either direction. To address other channels, simply increase the address of the two registers above by 4. Thus, start time for channel 1 is 0x0A, for channel 2 is 0x0E, channel 3 is 0x12, etc. and stop time address for channel 1 is 0x0C, for channel 2 is 0x10, channel 3 is 0x14, etc. See the table below. If you write a 0 to the start address, every degree of offset from 90 degrees requires 4.6 counts written to the stop address. In other words, multiply the number of degrees offset from neutral you wish to achieve by 4.6, then either add or subtract that result from 1250, depending on the direction of motion you wish. For example, a 45 degree offset from center would be 207 (45x4.6) counts either more or less than 1250, depending upon the direction you desire the motion to be in. We'll go over in some detail here how to access and use the pi servo hat in C++. Note that it's much harder than it is in Python, so maybe now's the time to learn Python? Full example code is available in the product GitHub repository. Note: This tutorial was written to control servo motors with 200Hz PWM. If you hear a "loud" buzzing noise or have difficulty controlling the servo motor, you may want to bring the frequency down to 50 Hz. Try checking out the Python example set for 50Hz and the PCA9685's datasheet for the I2C registers and settings needed to configure the Pi Servo Hat's PWM signals if you are adjusting the code for 50Hz in C++. We'll start by going over the files which must be included. Start by opening the i2c-1 file in /dev for reading and writing. You may wish to check the value returned by the open() function to make sure the file was opened successfully. Successful opening of the file results in a positive integer. Otherwise, the result will be negative. ioctl() is a general purpose function not specifically limited to working with I2C. The default setup of the PCA9685 chip is not quite right for our purposes. We need to write to a couple of registers on the chip to make things right. First we must enable the chip, turning on the PWM output. This is accomplished by writing the value 0x20 to register 0. Next, we must enable multi-byte writing, as we'll be writing two bytes at a time later when we set the PWM values. This time we don't need to set the length variable as it's already correctly configured. buffer = (1250>>8) & 0xff; // followed by the high byte. write(file_i2c, buffer, length); // Initiate the write. Now that you've successfully got your SparkFun Pi Servo Hat up and running, it's time to incorporate it into your own project! PCA9685 Datasheet (PDF) - To get a better feel for exactly how PCA9685 works and additional functionality it offers. Setting Up the Pi Zero Wireless Pan-Tilt Camera Tutorial - A kit that uses the Pi Servo Hat in a pan/tilt camera setup. For additional software example using the PCA9685, you can refer to the hookup guide for the Edison PWM Block, which uses the same hardware and is conceptually very similar. Or check out the example with the pan and tilt camera using the Pi Servo Hat. A quick overview of the features of the PWM Block. This tutorial will show you how to assemble, program, and access the Raspberry Pi Zero as a headless wireless pan-tilt camera. Guide for getting going with the Raspberry Pi 3 Model B and Raspberry Pi 3 Model B+ starter kit. In this tutorial, we'll show you how to use the Flask framework for Python to send data from ESP8266 WiFi nodes to a Raspberry Pi over an internal WiFi network. This tutorial will show you how to use a headless Raspberry Pi to flash hex files onto AVR microcontrollers as a stand-alone programmer. It also tells the story about production programming challenges, how SparkFun came to this solution, and all the lessons learned along the way. An introduction to MQTT, one of the main communication protocols used with the Internet of Things (IoT).